In Klipfolio, you have the option of deleting a data source or removing a data source. The results of each choice are quite different! When you delete a data source, it is deleted from your list of data sources and all associated Klips, and is no longer accessible. To delete a data source, click Data Sources > select the data source(s) to delete > click Delete. Note: Before deleting a data source, you can check to see which Klips are associated with it by navigating to Data Sources > About this Data Source > Associated Klips. When you remove a data source, you are removing its association with a specific Klip only. The data source remains accessible to you and is still stored in your list of data sources. However, if you remove a data source for a Klip that was created using formulas that refer to that data source, then the data source will not be removed for the Klip. 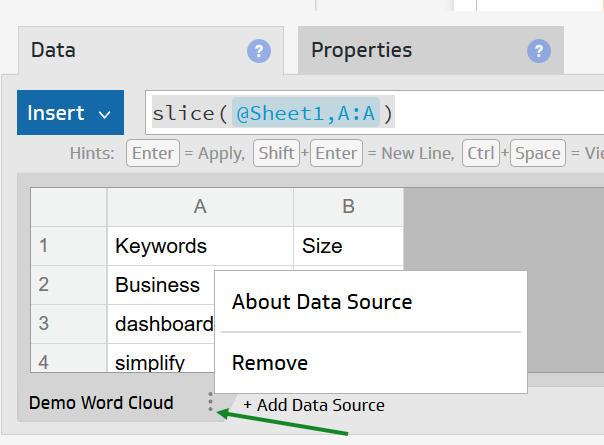 To remove a data source, in the Klip Editor, click the 3-dot menu for the data source you want to remove, and click Remove. Note: If you can't delete or remove a data source, check to see if you have the appropriate permissions.